What’s The Lowest Stamp Price You Can Recall? I don’t know how I missed it, but I guess last month the US Post Office announced that they want to institute a five cent increase in stamps. This would bring the price of a first class letter to a cool fifty cents. Changes are definitely needed at the Post Office, which has been hemorrhaging money and is facing something like fifteen billion dollars in losses. Personally, I think structural changes are the only thing that can save the USPS. As prices rise, I think you’ll find that people will just send less in the mail, so revenue won’t increase as much as they are hoping, if at all. I thought it would be fun to ask readers where they first remember the price of postage. The cheapest stamp price I remember was twenty cents, which according to Wikipedia, was the price between November 1981- February1985. I was anywhere between 7-10 during this time, so that seems about right as to when I would have had an awareness on this particular price. 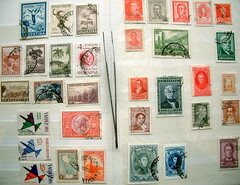 What’s the earliest memory you have of postage prices? Would a five cent (11%) increase cause you to send less mail than you do today?